To take forward the Government’s 2012 Future of Heating Strategy, a series of actions were set out in a further report published earlier this year – The future of heating: meeting the challenge which includes a major chapter on heat networks. Not suprisingly, London is featured prominently with examples of recent activity on developing decentralised energy networks in Islington, the Upper Lea Valley, the Olympic Park and Stratford City, as well as the heat network installed in The Shard. £3m over two years will be committed to HNDU to provide specialist expertise and be a “bridge between the local authority and the market, acting as a ‘critical friend”. The unit will also have a “funding stream of £6m over two years [which] will be available to local authorities. It will contribute to the cost of procuring technical reports and advice on the phases of a heat network’s development.” [p57] The HNDU team held a workshop in London last week where they set out their likely criteria for how they will judge applications to the fund – see the final slide (slide 12) of the following DECC presentation for full details on this. Attendees to the workshop were also informed that the HNDU team is being finalised at the moment, with an announcement expected shortly on the appointment of a lead Investment Director who will head the unit. Finance is anticipated to become available to local authorities for qualifying projects from this Autumn. Though the HNDU team has set itself a 7-year business plan – funding secured from DECC only lasts until 2015 at the moment. July 2013: Deputy London Mayor Sir Edward Lister visited National Grid’s London Power Tunnels construction site in Wandsworth. The project will create a 32km “electricity superhighway deep below the capital”. Read full news release here. More on the London Power Tunnels project here. Are London Health & Wellbeing Boards taking fuel poverty seriously? More than half of the Health and Wellbeing Boards appear to be side-lining issues surrounding fuel poverty altogether. Only 4% seem to be doing as much as possible to help combat fuel poverty within their local community. Each Health and Wellbeing Strategy available was given a rating of between 1 and 5 (indicating poor to excellent respectively). Of the five example strategies examined and given the worst rating (1), two London local authorities are highlighted – Ealing and Waltham Forest. Worryingly, page 6 of the report sets out the 122 strategies examined, a further 12 London boroughs are rated (1): Barnet, Brent, Bromley, Camden, Hackney, Hillingdon, Hounslow, Islington, Kensington & Chelsea, Lewisham, Merton, Newham. The City of London, Croydon, Greenwich, Haringey, Harrow, Kingston, Sutton, Westminster are rated (2). Havering and Wandsworth are rated (3). A few boroughs appear to have been omitted from the table on page 6 – but are referenced in the Appendix on page 19. Barking and Dagenham actually scores the highest with a (4), Redbrige a (3), Richmond (2), and Tower Hamlets (1). Strategies for Bexley, Enfield, Hammersmith & Fulham and Lambeth were not available to the survey team. Page 19 also mentions that Southwark’s stategy could not be found. The results are highly surprising, rating some London local authorities which have significant fuel poverty programmes in place very low (Islington being the most obvious – with its award-winning SHINE programme – which is now also being utilised by Hackney), suggesting that the consultation process that took place to establish these strategies failed to engage properly with relevant officers delivering such services. The Mayor has recently responded to some questions to him regarding his role in raising energy issues to the new Health and Wellbeing Boards – highlighting some recent work undertaken by the London Climate Change Partnership and stating that further guidance ‘bespoke environmental guidance for the 33 health and wellbeing boards in London is curently being drafted (see here and here). Details of the new London Health Board, also critical to this discussion, can be seen in an earlier post here. National Energy Action (NEA) held an excellent event earlier this year in Southwark – Achieving public health outcomes on fuel poverty and excess winter deaths – which looked at how health management is being devolved to local authorities and how fuel poverty needs to be integrated in these new strategies. Presentations from the seminar are available here. A Local Government Association briefing note produced shortly after provides some useful background on the guidance requirements. the Mayor and climate change denial; whether the Mayor will be publishing an update to his Climate Change Adaptation Strategy; if an audit of the London Energy Efficiency Fund (LEEF) will be undertaken; progress under LEEF; promotion of water efficiency measures; commissioning an energy security of supply study for London; the proposed Memorandum of Understanding between the Mayor and energy suppliers; Energy Performance Certificates (EPCs) and RE:NEW; confirmation of the single loan provided by LEEF; the Transport for London (TfL) energy strategy; TfL emissions action plan; clarification on the Mayor’s policy on waste incineration; fracking in London; the Mayor’s comments on climate prediction; differences between the Mayor’s comments on climate prediction and the London Climate Change Adaptation; the Mayor’s 2013/14 budget for climate adaptation; TfL climate risks action plan; the Mayor’s work with the insurance industry on building regulations; funding a health sector building to be climate resilient; climate risk information to Health & Well Being Boards; the Mayor’s commitment to look at overheating; work on risks related to flooding and critical infrastructure; flood risk data portal; surface water management plan for London; performance of the Green Deal in London; avoiding future electricity blackouts in London; weather data for London; work on the London Rivers Action Plan; developing community-led responses to heatwaves in London; buildings in London using cool-roof technology; studies with social housing groups on insulation and overheating; work with CIBSE on overheating in new developments; green roofs in London; helping offset the Urban Heat Island (UHI) effect in London; in light of the Mayor’s recent article – whether he will be abandoning Action 5.1 of his Climate Change Adaptation Strategy; an update on the London Drought Plan; the number of schools in London with rainwater harvesting systems; work on an intensive urban greening retrofitting pilot project to manage surface water flood risk; the work of the Drain London Forum; working with communities at flood risk; approved suppliers on the RE:FIT framework; the Citigen CHP scheme; how the Mayor will stop the Green Deal being a total disaster in London; Job losses in the insulation industry. July 2013: There’s continues to be much debate about climate science in the media – most often by non-climate scientists – including contributions by the Mayor in a recent article “The weather prophets should be chucked in the deep end” (see here and here for details). More recently (14 July) an interview by journalist Andrew Neil with Ed Davey, Secretary of State for Energy and Climate Change, on his BBC show The Sunday Politics, has reignited the debate on the media’s coverage, impartiality and bias on presenting climate change science to the public. Following the programme, there was much debate on statements made by Mr Neil during the show which resulted in the following communications: (Initial critique of Sunday Politics show; Andrew Neil response; response to that response!). Mr Davey and DECC have unusually decided to remain silent on the issue since the interview. As this latest debate on climate science was initiated by a BBC show and Mr Neil’s response is posted on a BBC website, it’s worth looking again at the 2011 BBC Trust review of impartiality and accuracy of the BBC’s coverage of science which, amongst other issues, looked at the corporation’s reporting on climate change. The report was commissioned by the BBC Trust and undertaken by Professor Steve Jones of UCL. “A poll carried out by the Cardiff University Understanding Risk Group in early 2010 showed in contrast that one in seven among the British public said that the climate is not changing and one in five that any climate change was not due to human activity. Fewer than half considered that scientists agree that humans are causing climate change. The divergence between the views of professionals versus the public may be seen as evidence of a failure by the media to balance views of very different credibility. The BBC is just one voice but so many in Britain gain their understanding of science from its output that its approach to this question must be considered. “…The real discussion has moved on to what should be done to mitigate climate change. Its coverage has been impeded by the constant emphasis on an exhausted subject whose main attraction is that it can be presented as a confrontation. “For at least three years, the climate change deniers have been marginal to the scientific debate but somehow they continued to find a place on the airwaves. Their ability so to do suggests that an over‐diligent search for due impartiality – or for a controversy – continue to hinder the objective reporting of a scientific story even when the internal statements of the BBC suggest that no controversy exists. There is a contrast between the clear demands for due impartiality in the BBC’s written guidelines and what sometimes emerges on air. It’s interesting to note that BBC Chairman Lord Patten reported to the House of Commons Culture, Media and Sports Select Committee only earlier this year that on climate change the BBC hasn’t “always dealt with the issue as well as we could have done. For example, I will not mention the individuals, but one or two individuals have not been well treated on this issue in the past.” [Q133]. July 2013: Housing group Affinity Sutton has issued the final research report – as part of their Future Fit project – which examines the actual energy savings achieved by 150 homes as a result of installing energy efficiency measures. It’s an excellent study with some key findings which will be of important consideration to policy-makers on programmes such as the Green Deal. A fabric first approach does work and residents,on the whole, have felt benefits from living in a retrofitted home. Identifying energy savings was challenging and there needs to be more transparent mechanisms to show energy usage in the home. Electricity use is unpredictable. Adding the GreenDeal charge to the electricity bill will make identifying savings even harder and could result in bad press for the policy. SAP is not an appropriate tool for a PAYS model and could result in negative consequences for three out of four Affinity Sutton residents if they were to take up the Green Deal. July 2013: A recent meeting of the London Infrastructure Group, part of the London Enterprise Panel (the local enterprise partnership for London) included a paper considering requirements for London’s growing electricity infrastructure. UKPN is currently consulting on its 2015 – 2023 Business Plan which is to be submitted to Ofgem. Much of the detail around UKPN’s proposals in the Plan have been discussed in recent meetings of the Mayor’s High Level Electricity Working Group and an appendix paper to the London Infrastructure Group meeting considers some key elements of the Plan. The papers report that the Mayor has raised concerns regarding future investment in London’s electricity distribution infrastructure and that UKPN latest proposals “represent a step backwards regarding the prospects of UKPN investing in advance of need. It gives rise to concern about whether UKPN has taken sufficiently full account of the needs of the City of London and other central London boroughs facing business and development growth. The reason for the backward step is mainly attributable to the intervention of Ofgem” (some of these concerns on future needs were recently raised by businesses in the recent West End Commission report). Investment in major substations has been reduced from £170 million to £100 million compared to the original draft. 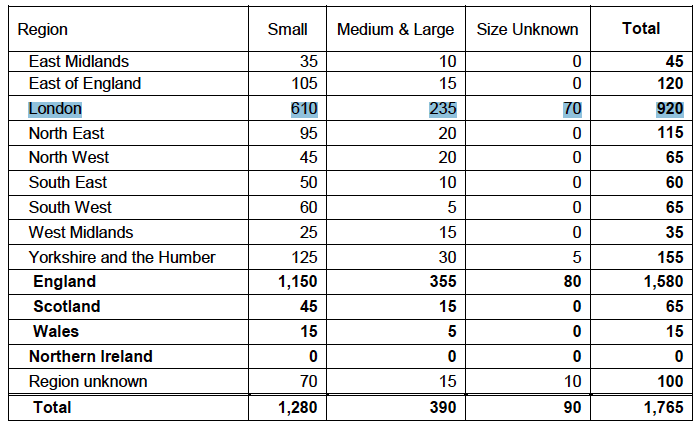 UKPN now includes only four of the planned six (plus Earls Court1) major substations for central London on a funded basis (see Table 1 below for details). The origin of the change is principally Ofgem’s unwillingness to accept the remaining three substations as part of UKPN’s regulated asset base, since they would amount to investment by UKPN in advance of an actual connection being requested. Interesting to note that other changes have been made to UKPN’s forecasts of sustainable energy investment in response to comments to the original consultation. These include changes to the assumptions regarding the uptake of electric vehicles and to the infrastructure investment for Feed–in–Tariff eligible generation. 17 July 2013: Labour MP for Harrow West Gareth Thomas has asked the following parliamentary question on Londoners typical energy costs. These data are taken from the Living Costs and Food survey (LCFS), run by the Office for National Statistics (ONS). The data are published in the form of three year averages, due to the small sample sizes involved in this survey. The 2009-11 period is the latest for which data is available. The spend data shown are an average for all households, and do not specifically focus on families, as data at this level of detail is not available. July 2013: The London Energy Efficiency Fund (LEEF) was established in November 2011 with £100m to invest in energy efficiency retrofit to public sector-owned / occupied buildings. To date one loan has been made to the Tate Modern. Your funding requirement is between £1m and £20m. 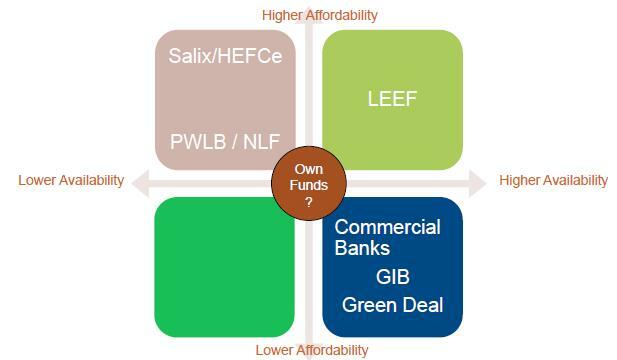 The presentation also illustrates (below) how LEEF funding compares to other typical public sector funding opportunities, such as Salix Finance, the Public Works Loan Board (PWLB), the Higher Education Funding Council for England (HEFCE) and the Green Investment Bank – stating that LEEF offers higher affordability and higher availability than all these other funds.